Last week, Google held its annual Google I/O developer conference, during which, the Google+ team launched Events. One of the key features is that each Event can have associated photos, which may be uploaded live as the event transpires, or after the fact. To help demonstrate the live Event photos, called Party Mode, I shot photos of the Google I/O after-hours party using a pair of Eye-Fi cards, so that my DSLR shots ended up in the Event in real-time. For this post, I've had a chance to pick the best images and do some post-processing, but all of the images were originally published in real-time as the after-hours party unfolded. Click here to see the G+ Event. 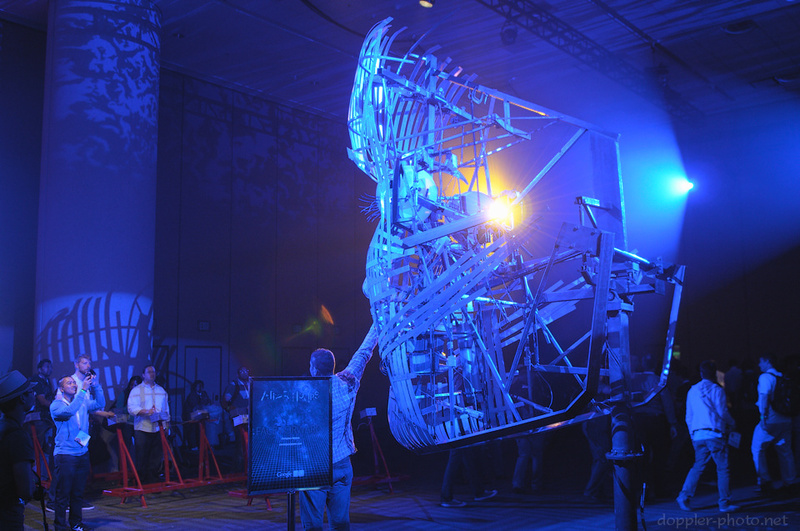 A giant animatronic face greeted party attendants as they streamed into the after-hours party room in Moscone West. The facial postures could be individually controlled by people at the red control stations. 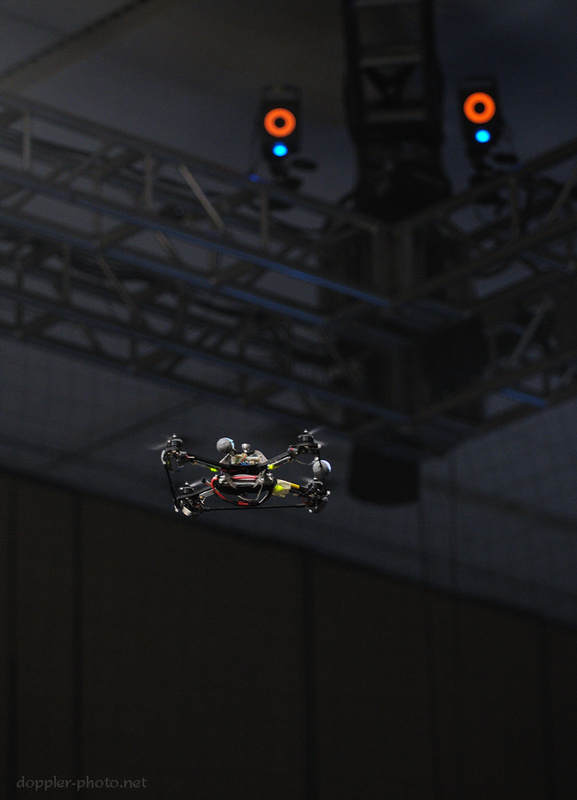 An autonomous quad-rotor hovers between consecutive attempts at a triple-flip. The system used a variety of (I believe infrared) cameras to identify the location and orientation of every quad-rotor in the netted flying area. In the triple-flip demo, the quad-rotor learned with each attempt, such that every time, it got closer to the ideal of flipping three times without moving away from the start location. The evening included two musical performances. San Francisco native group Train hit the stage first, in what was likely a tune-up for their upcoming "California 37" album tour, set to begin on July 10th. During their set, lead singer Patrick Monahan picked two audience-members to come on stage and participate in a sing-off to win an autographed guitar. Here, Monahan sings along with the two guests for a moment, before awarding the guitar to the young boy after a short audience vote. 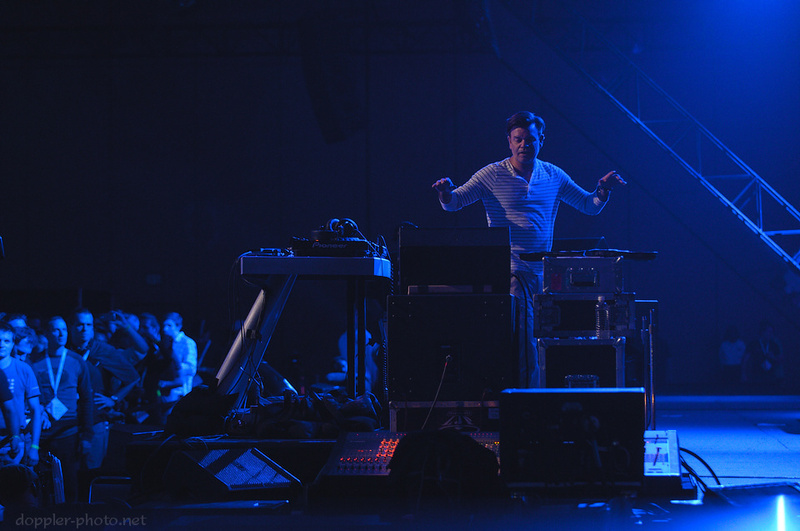 Next up was electronic DJ Paul Oakenfold. It looked like he was spinning vinyl, and he would dance away from his decks periodically to grab records from his collection. 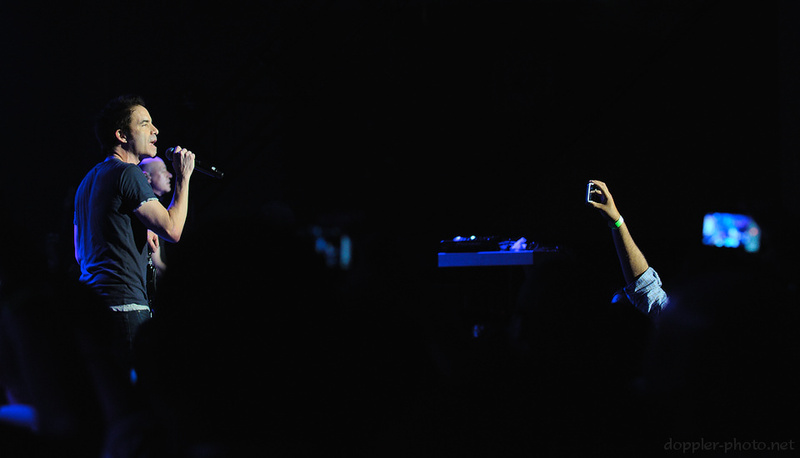 At one point during the evening, Oakenfold welcomed a small family of 3 onstage to take photos as he was spinning. 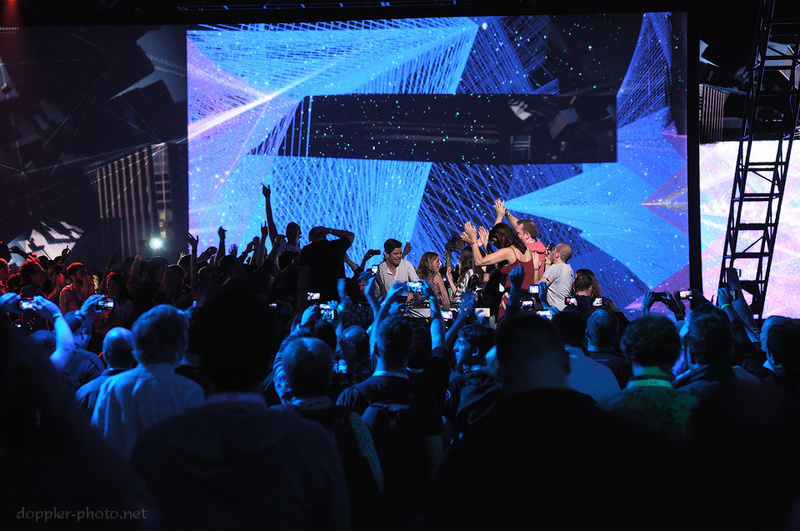 But within a couple minutes, the entire stage was filled with dancing fans, as pictured. The event staff finally managed to clear the stage only moments before Oakenfold's set finished, at which point he thanked the audience and left.